Food for thought on all things teaching and learning. If you’re like us, you worry that your high school students, especially high school seniors, have NO idea what the real world has in store. 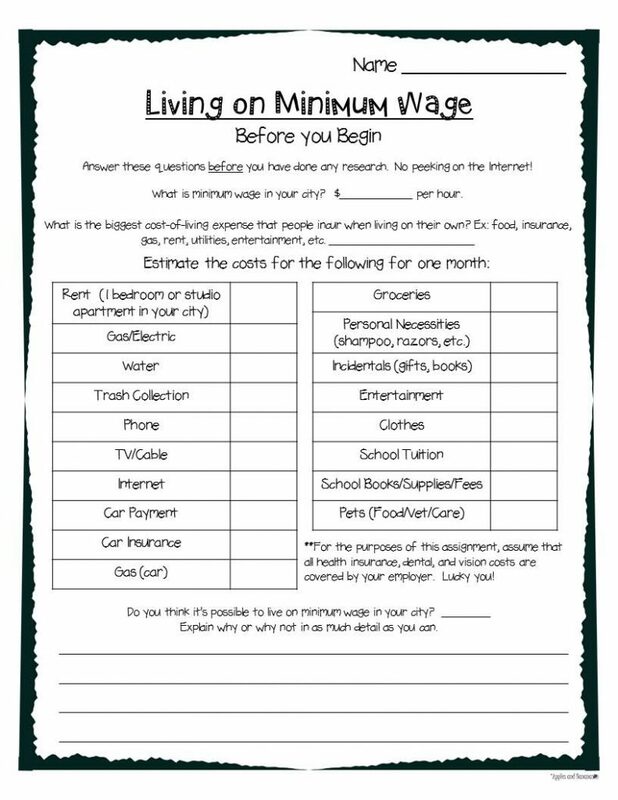 A great project to do in a Life Skills, Advisory, or Financial Literacy/Consumer Education class is a “Can You Live on Minimum Wage?” project. The truth is, not all students are headed for college, or know what they want to “be when they grow up.” Life happens. Kids may lose parental support for one reason or another. They could realize that college is not for them, or that they need a break before diving into a long school or training program. Students may be on the verge of dropping out of high school. Some students may not have a true understanding or appreciation for how hard their parents work to provide for them. ALL students can benefit from learning about the realities of living on minimum wage. Before diving in to this type of project, you need to gauge what students already know and believe about living on minimum wage. 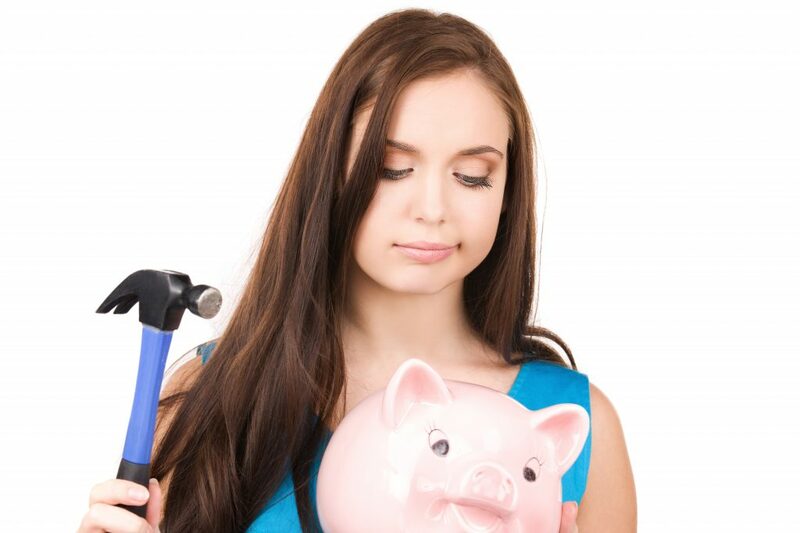 How much do students consider when they think about monthly living expenses? Do students know what the minimum wage is in your city? What do students think that an average apartment costs? 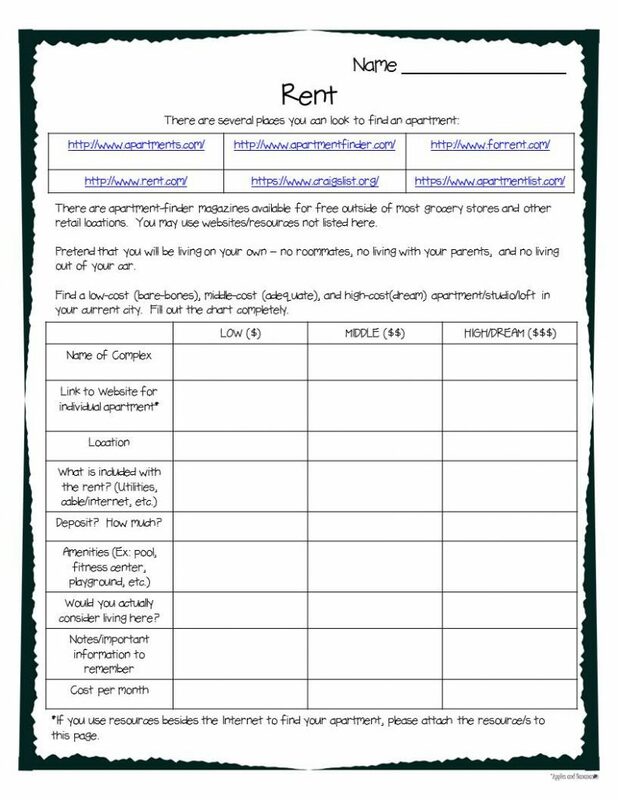 It’s good to get a baseline without letting students talk to each other or spend any time on the Internet. They will love comparing their actual results to their “pre-project” projections. There are many ways you can conduct this project, but we have found that making it an individual project is very powerful. Every student has different pre-conceived notions about living on their own, as well as their own life experience. Some students may already have their first job, while others have never even thought about working until after college. We have a packet that will guide students through every step of the process. 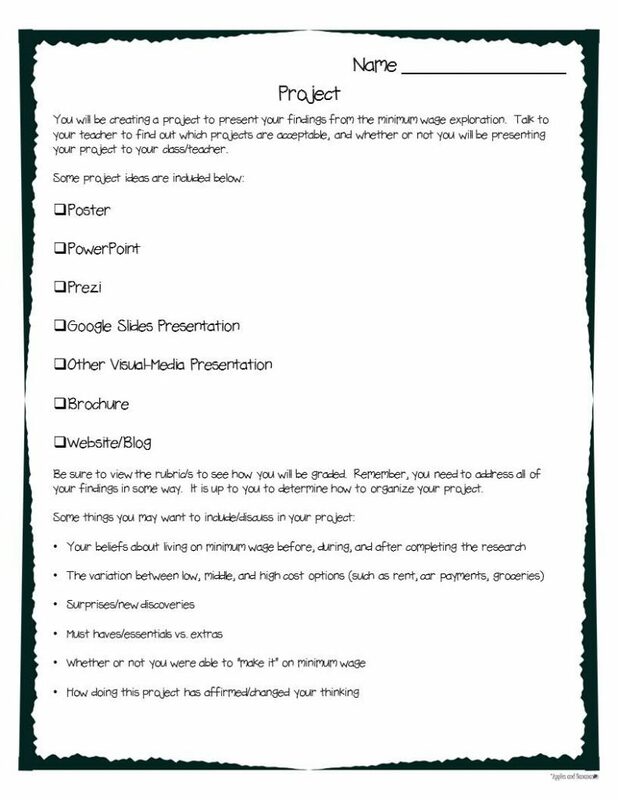 Our project includes a chart where expenses are listed by category, individual assignments for each category, a presentation component (students create a poster, PowerPoint/Google Slides/Prezi, etc.) with rubrics, and reflections. In our setting, students present their findings individually, and their teacher/consultant is able to really probe the student to assess their depth of understanding. Students MUST have a place to live, some form of transportation, food, utilities, phone, cable and/or Internet, personal necessities, and clothing. Obviously not all students will choose to have pet or pay school tuition/fees. Regardless, students should be able to discuss why they do or do not have certain items included. Students need to have some form of PROOF about how much items/services cost. For example, if students are renting an apartment, they need to have the advertisement (Craigslist, apartments.com, etc.) stating the rents and the specs. If the apartment states that it includes utilities, students can note this on their charts. Shock – most students can’t believe how hard it is to live on minimum wage. $20,000 a year might sound like a lot of money to a 17-year old, but when they start breaking down the monthly expenses, they realize just how little it really is. Gratitude – This project leaves many of our high school students with a sense of gratitude towards their parents. Something we often hear is, “I feel so bad for my mom and dad.” Students realize that asking their parents for money may have seemed like no big deal in the past, but they become more aware of how their actions affect the entire family. Motivation – Many students who had not previously considered continuing their education are suddenly motivated to do so. The alternative to living on minimum wage is earning MORE of a wage, and in order to do so, SOME form of advanced training or schooling must take place. Students who want to live a comfortable lifestyle in the future realize that they will need to earn more than a minimum wage. Desire to Live at Home – Some headstrong students who wanted to immediately move away from their parents when they graduate realize that living at home for awhile can give them a financial edge. Desire to Move Away/Out of State – Students who live in expensive cities may realize that moving to a different city or state is their best bet for being able to live on minimum wage. Other cities may have a lower minimum wage, but may also have a lower cost of living. Once students have completed the project, it is important to have some conversations with the student and/or the class. We always ask our student, “Did you find this project valuable?” and the answer is always “Yes!” Many students say that this project actually applied to their real life and that they learned a lot by doing it. We have a few other products in our store that help students prepare for life in the real-world, such as our job/interview product, as well as our career exploration product. We would love to hear what types of real-world projects you are doing with your high school students. Feel free to leave a comment below! Click here to sign up for our list. Receive monthly newsletters and access to our member-only Resource Library which includes the links to all of the documents mentioned in this post! Subscribe to be added to our mailing list! Copyright © 2019 Apples and Bananas Education. Powered by WordPress. Theme: Spacious by ThemeGrill.